Curious on how do you spot a Nerd? Michael is the Program Coordinator at the H.R. MacMillan Space Centre where he has been an astronomy educator for over 11 years. 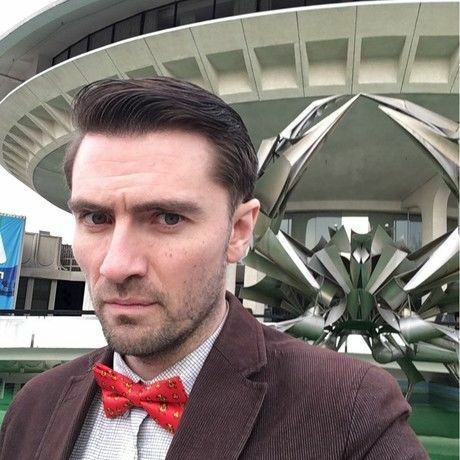 He is also the co-founder of Nerd Nite Vancouver, an informal monthly bar lecture series now going into its 4th year. Each month Nerd Nite brings a variety of people to talk about their science, art, or other nerdy passions to the stage to talk with a curious audience. He is also a proud team member of Sci-CATS, the Science Communication Action Team, which creates and delivers accessible science communication training. His own passions of course are space, but also Star Wars, pinball, and fine cheeses. Creativity for me starts by being a curious nerd, which I would define as someone who is passionate about finding answers. If I don’t know the answer to something, I will start the process of finding out, which may lead me to people that do know, which in turn will bring me to a creative thought or idea. When I was younger my creativity was very insular, but I felt that as I got older I learned to find collaborators that could help mold these creative ideas which has helped me find homes in my life and career. It will usually stem from a new idea that I’ve heard from someone, either at Nerd Nite, or on a podcast. Then some quiet contemplation, looking at the ocean, or staring at the stars is my usual go-to places to let thoughts percolate. It’s okay to be weird. I grew up in a conservative Christian home, I had lots of questions and lots of ideas, but most of them I just kept in my brain and didn’t write them down or share them with anyone. If you feel like an alien on this planet, don’t worry you’re not alone, there’s a lot of us out here. Be open to finding other people like you, be weird, be nerdy, you’ll be surprised what you discover about yourself when you do. I just discovered James Burke, he had science history shows on the BBC in the 1970’s, he’s still alive, although I doubt he gives many public talks anymore, but he seems like the kind of guy I would feel giddy listening to as he weaves intricate philosophical science-history-lesson-stories. I didn’t have many talents as a kid, but I felt that I was really good at daydreaming. Now I get to think of wild ideas, and then implement them. I also wanted to be a time traveler which I also get to do as an astronomy educator, thinking about the past, present, and future all at once is the heart of knowing what the cosmos is all about. Usually while working in the planetarium or at my desk I’m listening to Brian Eno, its good thinking music. I also devour local artists that I want to work with like Louise Burns, she’s amazing, and she’s going to be playing music in the planetarium on Valentines Day while I talk about the stars. At some point in the next year I’m hoping to work with Loscil. His music is a perfect fit for the ambient star gazing venue of the planetarium.